For the 1999–present F-250 and higher models, see Ford Super Duty. "F150" redirects here. For other uses, see F150 (disambiguation). "Ford F1" redirects here. For Ford factory Formula One racing efforts, see Stewart Grand Prix. The F-Series has been the best-selling pickup truck in the United States since 1977 and the best-selling vehicle since 1986; it is also the best selling vehicle in Canada. As of the 2018 model year, the F-Series generates $41 billion in annual revenue for Ford, making the brand more valuable than Coca-Cola and Nike. In 1999, to bridge the gap between its pickup line and its medium-duty trucks, Ford introduced the F-250 and F-350 as Super Duty trucks. Considered an expansion of the F-Series, the Super Duty line is built on a distinct chassis architecture with heavier-duty components. In 2000, the Super Duty range was expanded to include Ford medium-duty trucks. At various times, Ford has marketed the F-Series across all three of its divisions in North America. Mercury sold the F-Series as the M-Series from 1948 to 1968 in its Canadian sales network (alongside the Econoline and medium-duty trucks); during the 2000s, Lincoln sold the Blackwood and later the Mark LT. The first-generation F-Series pickup (known as the Ford Bonus-Built) was introduced in 1948 as a replacement for the previous car-based pickup line introduced in 1942. The F-Series was sold in eight different weight ratings, with pickup, panel truck, cab-over engine (COE), conventional truck, and school bus chassis body styles. For the 1953 model year, Ford introduced a second generation of the F-Series trucks. Increased dimensions, improved engines, and an updated chassis were features of the second generation. In another change, the model nomenclature of the F-Series was expanded to three numbers; this remains in use in the present day. The half-ton F-1 became the F-100 (partially influenced by the North American F-100 Super Sabre); the F-2 and F-3 were combined into the ¾-ton F-250 while the F-4 became the one-ton F-350. Conventional F-Series trucks were F-500 to F-900; COE chassis were renamed C-Series trucks. While the cabs, doors, rad support, inner fenders and hoods are the same from 1953-1956 F-100 & F-250s (the fenders varied on F250, 350,500 and long boxes were only available on F-250), in 1956 the cab underwent a major revision. Centered around a wraparound windshield, the cab was given new doors, a redesigned dashboard, and an (optional) panoramic rear window). In line with Ford cars, the 1956 F-Series offered seat belts as an option. Introduced in 1957, the third generation F-series was a significant modernization and redesign. Front fenders became integrated into the body, and the new Styleside bed continued the smooth lines to the rear of the pickup. Ford introduced a dramatically new style of pickup in 1961 with the fourth generation F-Series. Longer and lower than its predecessors, these trucks had increased dimensions and new engine and gearbox choices. Additionally, the 1961–1963 models were constructed as a unibody design with the cab and bed integrated. This proved unpopular and Ford reverted to the traditional separate cab/bed design in 1964. In 1965, the F-Series was given a significant mid-cycle redesign. A completely new platform, including the "Twin I-Beam" front suspension, was introduced that would be used until 1996 on the F-150 and until 2016 on the F-250/350 4x2. Additionally that year, the Ranger name made its first appearance on a Ford pickup; previously a base model of the Edsel, it was now used to denote a high-level styling package for F-Series pickups. Introduced in 1967, the fifth generation F-series pickup was built on the same platform as the 1965 revision of the fourth generation. Dimensions and greenhouse glass were increased, engine options expanded, and plusher trim levels became available during the fifth generation's production run. Suspension components from all 1969 F-Series models are completely interchangeable. Perhaps the most rare of this series is the Heavy Duty Special, often confused with the Camper Special. However, the Heavy Duty Special is a 1/2 T with upgraded heavy duty parts such as Firestone overload rear leaf mounts, larger brake drums and axles. A variant of the fifth generation F-series was produced until 1992 in Brazil for the South American market. The sixth generation F-series was introduced in 1973. This version of the F-series continued to be built on the 1965 fourth generation's revised platform, but with significant modernization and refinements. Front disc brakes, increased cabin dimensions, full double wall bed construction, increased use of galvanized steel. The FE engine series was discontinued in 1976 after a nearly 20-year run, replaced by the more modern 335 & 385 series engines. In 1975, the F-150 was introduced in between the F-100 and the F-250 in order to avoid certain emission control restrictions. For 1978, square headlights replaced the previous models' round ones on higher trim package models, such as Lariat and Ranger, and in 1979 became standard equipment. Also for 1978, the Ford Bronco was redesigned into a variant of the F-series pickup. 1979 was the last year that the 460 engine was available in a half ton truck. The 1980 F-Series was redesigned with an all-new chassis and larger body; this was the first ground-up redesign since 1965. The exterior styling of the truck was redone to improve aerodynamics and fuel economy. Medium-duty F-Series (F600-F900) were also redesigned; although they shared the cabin of the smaller pickup trucks, the largest version of F-Series now wore a bonnet with separate front wings (like the L-Series). 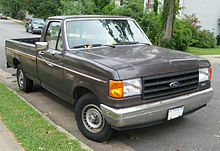 Medium duty Ford F-Series would carry the 1980–1986 interior design until 2000 (though pickups were restyled again in 1987 and 1992), with very subtle changes such as window glass and electronics. In a move toward fuel efficiency, Ford dropped the M-Series engines (the 5.8 Liter 351M and 6.6 Liter 400 cu in V8s) in 1981, replacing them with the 4.2 Liter 255 C.I. and 5.8 Liter 351 C.I. Windsor V8 engines from the Panther platform. The 255 V8 was simply a 5.0L, 302 V8 with a smaller bore, built specifically for better fuel economy, but was dropped for the 1982 model year due to being underpowered and having limited demand. For 1982 and 1983, the 3.8L, 232 C.I. Essex V6 was the base engine but was quickly dropped for the 1984 model year. In 1983, Ford added Diesel power to the F-Series through a partnership with International Harvester (later Navistar). The 6.9L, 420 C.I. IDI V8 produced similar power output as the gasoline 351 Windsor V8, with the fuel economy of the 4.9L, 300 I6. From this point on (1983-present), the heavier duty f-series trucks (F-350 and above) were usually equipped with the Diesel engines as standard horsepower. 1985 was the first year of electronic fuel injection on the 5.0L V8, all other engines following suit in 1988. There was a new "high output" version of the 5.8L Windsor beginning in 1984. A noticeable change was made to the F-Series in 1982 as the Ford "Blue Oval" was added to the center of the grill, also the Ranger and Custom trims were no longer available. The Ranger name had been shifted onto the all-new compact pickup developed as a replacement for the Courier. The new trim levels were a no-badge base model (essentially the new Custom), XL, a very rare XLS, and XLT Lariat. 1983 marked the final year of the F-100, making the F-150 the lightest pickup available on the market. F-100s and F-150s were virtually identical with the exception of smaller brakes. F-100s over a certain GVWR and/or without power brakes did use the F-150 axles. Also, the 1980–1983 F-100 was never offered with four-wheel-drive. 1986 marked the final year that the F-150 was available with a 3-speed manual gearbox that shifted via a steering column lever (3-on-the-tree). Incidentally, this was the second-last vehicle in the United States that offered this set up. 1986 was also the last year the Explorer package was available. This is the first generation of trucks to incorporate amenities such as power mirrors, power windows, and power door locks. The 1987 F-Series carried over the same body style from the seventh generation, yet sported a new rounded front clip that improved aerodynamics, as well as the softening of body lines around the rear of the bed and fender arches around the wheel wells. The interior was also completely redesigned in 1987. The transmissions available on SuperCab models were a four-speed or five-speed manual; regular cab models were also available with automatic transmission. The Custom trim made a comeback for the eighth generation. In 1988, the 4.9 Liter inline-six, 5.8 Liter V8, and 7.5 Liter V8 engines gained electronic fuel injection. International Navistar also increased the displacement of their 6.9 Liter V8 in the same year, resulting in the new 7.3 Liter unit. This was also the first year of a five-speed manual overdrive transmission, which included the Mazda M5OD in the F-150s and the heavy-duty ZF5 in the F-250s and F-350s. Four-speed manuals were discontinued as standard equipment after 1987, but were available as a customer-ordered option until 1989. In 1989, the C6 three-speed automatic was replaced as the base automatic transmission with the E4OD, a four-speed electronically controlled automatic overdrive unit, though the C6 was still available as an option, mostly in F-250s and F-350s, until 1997. Heavy-Duty models included F-250s and F-350s (along with F-Super Dutys) that were classified as incomplete vehicles only that were produced with no bed, but appeared as tow trucks, box trucks (notably U-Haul), flatbed trucks, dump trucks and other models..
For the 1992 model year, the body-shell of the 1980 F-Series was given another major upgrade. To further improve its aerodynamics, the forward bodywork was given a slightly lower hoodline, rounding the front fenders and grille; in addition, the changes matched the F-Series with the design of the newly introduced Explorer and redesigned E-Series and Ranger. Along with the exterior updates, the interior received a complete redesign. Dormant since 1987, the FlareSide bed made its return as an option for 1992. To increase its appeal for younger buyers, the bed bodywork was redesigned, borrowing the sides of the F-350 dual-rear wheel bed (fitted to the narrower F-150 single-wheel chassis). To commemorate the 75th anniversary of the first Ford factory-produced truck (the 1917 Ford Model TT), Ford offered a 75th anniversary package on its 1992 F-series, consisting of a stripe package, an argent colored step bumper, and special 75th anniversary logos. In 1993, the 240 hp SVT Lightning was introduced as a specially-tuned performance truck; over 11,000 were built from 1993 to 1995. 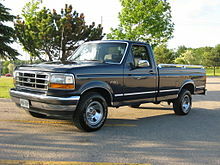 In a trim shift, the XLT Lariat was dropped and combined with the XLT; the XL took over for the Custom trim after 1993 (marking the last usage of the Custom nameplate by Ford). In 1995, the Eddie Bauer trim made its return. In 1995, the medium-duty Ford F-Series (F-600 through F-800 and all Ford B-Series) were given their first update since 1980. All versions (except severe-service) received a hood redesign which enlarged the grille and moved the turn signal indicators to the outside of the front headlights. During the second half of 1997, the F-250 HD (heavy duty) was in the same series as the F-350. The body style stayed the same until the end of 1997. The only change of the F-250 HD and F-350 was that they no longer has classic style tailgates, with the stainless steel cap on them which read FORD. Instead the tailgate had the F-250 Heavy Duty/F-350 nameplate labeled on its left side, while Ford's blue oval was labeled on The right side (similarly styled like the 1997 Ford F-150 around this same time). The F-250 HD also had some minor changes in trim location, and options available. The 1997 F-250 HD with the 7.3 Powerstroke Diesel is also the rarest and most desirable of ninth generation Fords. Following the introduction of the tenth-generation F-150, the F-250 and F-350 continued into production into the 1998 model year, becoming part of the Ford F-Series Super Duty line as they were replaced in 1999. For 1997, Ford Motor Company made a major change to its F-Series family of trucks as the F-Series pickup line was essentially split in two. During the 1970s, 1980s, and 1990s, buyers of pickup trucks had increasingly purchased the vehicles for the purposes of personal use over work use. To further increase its growing market share, Ford sought to develop vehicles for both types of buyers. In its ultimate decision, the company decided to make the F-150 as a contemporary vehicle for personal use, while the F-250 and F-350 would be designed more conservatively for work-based customers. Introduced in early 1996 as a 1997 model, the F-150 was a completely new vehicle in comparison from its predecessor. Similar to the original Ford Taurus of 1986, the 1997 F-150 was developed with a radically streamlined body. Dispensing with the traditional Twin I-Beam for a fully independent front suspension, the all-new chassis only shared the transmissions with the previous generation. In a major change, the long-running 4.9L inline-6 was replaced by a 4.2 L Essex V6 engine as standard. The 4.6 L Modular V8 shared with the Panther Car was optional (with a bigger 5.4 L Triton V8 version added in mid-1997). Originally developed for use in the F-Series, the Modular/Triton V8 was the first overhead-camshaft engine ever to be installed in a full-size pickup truck. To improve rear-seat access for SuperCab models, a rear-hinged (curb-side) door was added to all versions. Following its popularity, the SuperCab gained a fourth door for 1999. In 2001, the F-150 became the first pickup truck in its size segment to become available with four full-size doors. Sharing the length of a standard-bed SuperCab, the F-150 SuperCrew was produced with a slightly shortened bed. During the second half of the 1997 model year, Ford introduced a heavier GVWR version (8800 GVW), bearing the F-250 name. It was distinguished by a unique seven-lug bolt pattern for the wheels. At the same time, the F-250 HD (heavy duty) was in the same series as the F-350 (same square body style as the last generation F-150; it was still built in South America only). Due the Super Duty trucks never reaching Ford dealerships as for sale until the beginning of 1999, Ford produced a lighter duty F-250, using the same body the F-150 had at the time as a temporarily model (1997 to 1999). By February 1999, the f-150-based F-250 was discontinued and the Super Duty trucks finally marketed for sale. In 1999, the SVT Lightning made its return, with output expanded to 360 hp; over 28,000 were produced from 1999 to 2003. For 2002, Lincoln-Mercury gained its first full-size pickup truck since 1968 with the introduction of the Lincoln Blackwood, the first Lincoln pickup. Sharing the front bodywork of the Lincoln Navigator SUV and the same cab body work as the Ford F-150, the Blackwood was designed with a model-exclusive bed and was sold only in black. Due to very poor sales, the Blackwood was discontinued after 2002. In 1999, the F-250 and F-350 pickups were introduced as the 1999 Ford F-Series Super Duty model line. While remaining part of the F-Series, the Super Duty trucks use a different platform architecture, powertrain, and design language, primarily as they are intended for heavy-duty work use. Designed in a joint venture with Navistar International, the medium-duty F-650/F-750 Super Duty were introduced in 2000. This generation of F-150 continued production in 2004 alongside the all-new F-150 as the F-150 Heritage. For the 2004 model year, the F-150 was redesigned on an all-new platform. Internally, a 3-valve version of the 5.4 Liter V8 was introduced and replaced the previous 2-valve version. Externally, the eleventh-generation model was different from its predecessor, with sharper-edged styling; a major change was the adoption of the stepped driver's window from the Super Duty trucks. Regardless of cab type, all F-150s were given four doors, with the rear doors on the regular cab providing access to behind-the-seat storage. Ford also introduced additional variants of the F-150. The FX4 Off-Road package available since the 2002 model year became its own trim level. A sportier version of the F-150 became available as STX, replaced by FX2 Sport in 2007. From 2005 to 2008, Lincoln-Mercury dealers sold this version of the F-150 as the Lincoln Mark LT, replacing the Blackwood. In late 2007 for the 2008 model year, the Super Duty trucks were given an all-new platform. While using the same bed and cabin as before, these are distinguished from their predecessors by an all-new interior and a much larger grille and head lamps. Previously available only as a chassis-cab model, the F-450 now was available as a pickup directly from Ford. 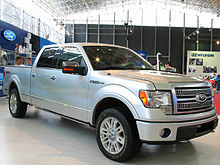 The twelfth generation F-150 was introduced for the 2009 model year as an update of the Ford full-size truck platform. Similar to its predecessor, these trucks are distinguished by their Super Duty-style grilles and head lamps; standard cab models again have two-doors instead of four. The FlareSide bed was continued until 2010, dropped along with the manual gearbox; outside of Mexico, the Lincoln Mark LT was replaced by the F-150 Platinum. A new model for 2010 included the SVT Raptor, a dedicated off-road pickup. As part of a major focus on fuel economy, the entire engine lineup for the F-150 was updated for the 2011 model year. Along with two new V8 engines, the F-150 gained a new 3.7 Liter base V6 engine, and a powerful twin-turbocharged 3.5 Liter V6, dubbed EcoBoost by Ford. An automatic transmission is the only option. Other modifications include the addition of a Nexteer Automotive Electric Power Steering (EPS) system on most models. A recent study conducted by iSeeCars.com and published on the Ford Motor Company website listed Ford F-250 Super Duty as the top longest-lasting vehicle and Expedition, Explorer and F-150 in the top 20 longest-lasting vehicle. The thirteenth-generation Ford F-Series was introduced for the 2015 model year. Largely previewed by the Ford Atlas concept vehicle at the 2013 Detroit Auto Show, the new design marked several extensive changes to the F-Series design. In the interest of fuel economy, Ford designers reduced curb weight of the F-150 by nearly 750 pounds, without physically altering its exterior footprint. To allow for such a massive weight reduction, nearly every body panel was switched from steel to aluminum (with the exception of the firewall); the frame itself remains high-strength steel. To prove the durability of the aluminum-intensive design, during the development of the thirteenth-generation F-Series, Ford entered camouflaged prototypes into the Baja 1000 endurance race (where the vehicles finished). The 2015 F-150 was the first pickup truck with adaptive cruise control, which uses radar sensors on the front of the vehicle to maintain a set following distance between it and the vehicle ahead of it, decreasing speed if necessary. The 3.7L V6 was dropped, replaced by a 3.5L V6 as the standard engine, with a 2.7L EcoBoost V6 added alongside the 3.5L EcoBoost V6. While the 6.2L V8 was withdrawn, the 5.0L V8 continued as an option, with a 6-speed automatic as the sole transmission. For the 2018 model year, the Ford F-150 underwent a mid-cycle redesign, being revealed at the 2017 New York International Auto Show. Following the introduction of the 2017 Super Duty model line, the F-Series (F-150 through F-550 and Ford Raptor) are again manufactured using a common cab (for the first time since 1996). For 2018, the F-150 shifted from the long-running 3-bar design used on Ford trucks to the 2-bar design that debuted on the 2017 Super Duty model line. The powertrain underwent several revisions, as the 3.5L V6 was replaced by a 3.3L V6 mated to a 6 speed transmission. The EcoBoost V6 engines and 5.0L V8 engines were fitted with a 10-speed automatic (from the Raptor) and stop-start capability (previously only from the 2.7L EcoBoost). In 2018, a PowerStroke diesel engine was fitted to the F-150 for the first time, as Ford introduced a 250 hp 3.0L twin-turbocharged V6 (from the "Lion" lineup of engines shared by PSA Peugeot Citroën and Jaguar Land Rover). Safety and driver assistance features improved and added for the 2018 model year include Pre-Collision Assist with Pedestrian Detection and Adaptive Cruise Control with Stop and Go. The crew-cab version of the 2018 F-150 reclaimed an IIHS Top Safety Pick rating. Ford F-150's advertisement called "Big Dog" takes subtle shots at the redesigned Chevy Silverado and Ram 1500. For 1961 into part of the 1963 model year, the Ford F-Series was offered with a third body configuration, integrating the Styleside bed with the cab. With the pickup bed stampings welded directly to the cab before both assemblies were mounted to the frame, the design simplified the assembly and paint process (the configuration was similar to that of the Ford Ranchero). Following a poor market reception, the unibody pickup bed design was withdrawn during the 1963 model year. From 1961 to 1979, Ford offered several Special option packages for the F-Series, typically designed for owners with specific uses for their vehicles. For 1961, the Camper Special option package was introduced; designed for owners of slide-in truck campers, the option package featured pre-wiring for the camper, heavy-duty transmission and engine cooling, and a larger alternator. For 1968, Ford introduced the Contractor's Special, and Farm and Ranch Special, which featured toolboxes and heavier-duty suspension. The Explorer Special was introduced as a lower-priced variant of the Ranger trim. The "Trailer Special" was offered as well with trailer brake, heavy-duty radiator, transmission cooler, and tow hitch. In 1980, the Special option packages were withdrawn as part of the F-Series redesign, while a number of features continued as stand-alone options; the Explorer continued as a variant of the Ranger trim through the 1986 model year. Sold from 1991 to 1992 on the Ford F-150 XLT Lariat, the Nite special edition was an monochromatic option package, featuring black paint and trim with a multicolor accent stripe. For 1991, it was exclusive to the regular-cab F-150; for 1992, it was available on all bodystyles of the F-150 and introduced on the Ford Bronco. The Nite edition was available with two-wheel drive or four-wheel drive with either the 5.0L or 5.8L V8; it also included a sport suspension and alloy wheels on 235/75R15 white-letter tires. For 1994, Ford introduced the Eddie Bauer trim level for the F-150. In a fashion similar to the same trim packages on the Aerostar, Bronco, and Explorer/Bronco II, it consisted of outdoors-themed interior trim with two-tone exterior paint. Introduced as a 1993 model, the Ford SVT Lightning is a high-performance version of the F-150 that was produced by the Ford Special Vehicle Team (SVT). Intended as a competitor for the Chevrolet 454SS, the SVT Lightning was derived from the F-150; to improve its handling, extensive modifications were made to the front and rear suspension and frame. Powered by a 240 hp version of the 5.8L V8, the Lightning used a heavy-duty 4-speed automatic transmission from the F-350 (normally paired with the 7.5L V8 or 7.3L diesel V8). While slower in acceleration than the GMC Syclone, the Lightning retained nearly all of the towing and payload capacity of a standard Ford F-150. Produced from 1993 to 1995, the first-generation SVT Lightning was withdrawn as Ford readied the 1997 Ford F-150 for sale. After a three-year hiatus, Ford released a second generation of the SVT Lightning for the 1999 model year. In line with its 1993-1995 predecessor, the second-generation Lightning was based on the F-150 with a number of suspension modifications; in a design change, all examples were produced with a FlareSide bed. In place of a model-specific engine, the second-generation was powered by a supercharged version of the 5.4L V8 from the F-150, producing 360 hp (increased to 380 hp in 2001). As before, the higher-output engine was paired with a heavier-duty transmission from the F-350 pickup. For the 2004 redesign of the Ford F-150, the SVT Lightning was not included, leaving 2004 as the final year for the model line. While of an entirely different design focus from the SVT Lightning, the SVT/Ford Raptor is the succeeding generation of high-performance Ford F-Series pickup trucks. From 2000 to 2011, the Harley-Davidson Edition was an option package available on the F-150. Primarily an appearance package featuring monochromatic black trim, from 2002 to 2003, the edition included a slightly detuned version of the supercharged 5.4L V8 engine from the SVT Lightning. In 2003, a 100th Anniversary Edition was produced for F-150 SuperCrew trucks. For 2004, the Harley-Davidson option package became available for F-250/F-350 Super Duty trucks. After 2008, the option package adopted many of the options featured from the Platinum trim level, featuring leather seating produced from materials reserved for Harley-Davidson biker jackets. For 2012, the Harley-Davidson Edition was replaced by the Limited trim level, retaining a monochromatic exterior appearance (shifting past motorcycle-themed trim). For 2010, Ford introduced its second high-performance truck, the SVT Raptor. In contrast to the enhanced on-road performance of the SVT Lightning, the SVT Raptor is a focused towards off-road use, in line with that of a Baja 1000 racing truck. While a road-legal vehicle, many design modifications of the Raptor were made to improve its off-road capability, with the vehicle featuring a model-exclusive suspension with long-travel springs and shocks. The Raptor shares only its cab with a standard F-150; to accommodate its larger tires, the Raptor is fitted with wider front fenders, hood, and pickup bed. Initially produced as a SuperCab, a Raptor SuperCrew was introduced late in the 2010 model year. For the first time on a Ford vehicle in North America since 1983, the word "Ford" was spelled across the grille of the SVT Raptor in place of the Ford Blue Oval badge. After a two-year hiatus, the second-generation Ford Raptor (the SVT prefix was removed) was introduced for the 2017 model year. Derived from the thirteenth-generation F-Series, the Ford Raptor shifted to an aluminum body. Again produced as a high-performance off-road vehicle, the Raptor is produced in SuperCab and SuperCrew configurations, with long-travel suspension specific to the vehicle. As a design theme, the second-generation Raptor does not carry a Ford Blue Oval grille badge, instead spelling out "Ford" across the grille. To improve fuel economy and reduce weight, the 6.2L V8 was replaced by a 450 hp 3.5L twin-turbocharged V6, paired with a 10-speed automatic transmission. Introduced for 2009, Platinum is a luxury-oriented trim of the Ford F-150. Effectively replacing the Lincoln Mark LT in the United States and Canada (though its production continued through 2014 in Mexico), the Platinum adopted many of the luxury features and content from the Mark LT with more subdued exterior styling (the Platinum was fitted with an eggcrate grille similar to early models of the Ford Expedition). In 2013, Ford began use of the Platinum trim for Super Duty trucks, from the F-250 to the F-450 pickup trucks. Until 2016, the Platinum trim was an add-on package to a Super Duty that was ordered as a Lariat. 2017 saw the Platinum become a separate trim level. For the 2014 model year, Ford introduced the Tremor model of the F-150. The Tremor was released as a high-performance sport truck for street truck enthusiasts. The regular-cab Tremor is based on the style of the FX Appearance Package with the 3.5 Liter EcoBoost engine and a 4.10 rear axle. The interior uses a console-mounted shifter, custom bucket seats and a flow-through center console not found in any other F-150. The Tremor is available in both 4x2 and 4x4. Both options feature an electronic locking rear differential and customized suspension. There were 2,230 Tremors built. The truck won the San Felipe 250 eight times between 1999 and 2007. Greg Biffle won the 2000 NASCAR Craftsman Truck Series. Drivers such as Roger Norman and Larry Roeseler won the Primm 300 in 2003, 2007 and 2008. In 2008, Ford announced its entrance into the Baja 1000 class-eight race for moderately modified, full-size pickups. The driver of record was Steve Oligos, supported by co-drivers Randy Merritt, Greg Foutz, and Bud Brutsman. The vehicle was built with collaboration between the Ford Special Vehicle Team (SVT), Ford Racing, and Foutz Motorsports, Inc. The Ford F-150 SVT Raptor R completed the 2008 41st Tecate SCORE Baja 1000 race in 25.28:10, and ranked third in its class. Tavo Vildosola and Gus Vildosola won the event in 2010. In the Best in the Desert race series, an F-150 SVT Raptor R completed the "Terrible's 250" race, placing second overall in the class 8000. In January 2010, a single Raptor SVT (No. 439), driven by Chilean driver Javier Campillay, competed in the Argentina-Chile Dakar Rally. However, the pickup was unable to finish due to a catch-up crash with another car in the middle of the road during stage seven. In January 2011, two Raptors started in the Argentina-Chile Dakar Rally in Buenos Aires, with Campillay driving the more reliable Raptor (No. 375), and American female driver Sue Mead driving a T2 Raptor (No. 374). Mead crossed the finish line in Buenos Aires and won the "super production" class, the first North American class win in Dakar history. Campillay was unable to finish the 12th stage after losing time due to mechanical failure during the 11th stage, which led to his disqualification for failing to reach the race camp by the designated deadline. For most of its production, the F-Series was sold in a medium-duty conventional truck configuration alongside the traditional pickup trucks. Beginning in 1948 with the 1½ ton F-5 (later F-500), the medium-duty trucks ranged up to the F-8 (F-800). Prior to the 1957 introduction of the Ford C-Series tilt-cab, the medium-duty range was offered as both a conventional and in a COE (cabover) configuration. Following the introduction of the fifth-generation F-Series in 1967, the medium-duty trucks were designed separately from the pickup truck range. Although remaining part of the F-Series range, the medium-duty trucks shared only the cab and interior with the F-Series pickup trucks. Since 1967, the cab design has changed only in 1980 and in 2000. Redesigned on an all-new chassis, the 2017 F-Series medium-duty trucks retain an updated version of the 2000-2016 F-650/F750 cab. The medium-duty F-Series served as the donor platform for the B-Series cowled bus chassis produced from 1948 to 1998. Produced primarily for school bus bodies, the B-Series was discontinued as part of the sale of the Ford heavy-truck line to Freightliner in 1996. Above its medium-duty truck ranges, the Ford F-Series was used as a heavy-truck chassis during its early production. In 1951, Ford debuted its "Big Job" line, denoting the F-8 conventional. In 1958, the "Super Duty" and "Extra Heavy Duty" replaced the Big Job trucks, marking the debut of the Super Duty V8 engine line. In 1963, the N-Series became the first short-hood conventional built by Ford, replacing the F-900 Super Duty/Extra Heavy Duty. Although based on an all-new chassis and separate bodywork, the cab was sourced from the F-Series. In 1970, Ford introduced the L-Series "Louisville" line of conventional trucks, moving all heavy truck development away from the F-Series. The L-Series/Aeromax would remain in production through 1998, as Ford exited the North American heavy-truck segment. Outside North America, Ford builds the Ford Cargo, and Ford F-MAX. From 1948 until 1960, Ford manufactured the F-Series in a panel van configuration, largely replacing it with the Econoline in 1961. In contrast to General Motors, the panel van was never produced in a passenger "carryall" variant, such as the Chevrolet/GMC Suburban. For much of its production life, the Ford E-Series vans shared a high degree of mechanical commonality with the F-Series; in the late 1970s, some body components were shared. Since the 1990s, this changed somewhat, as Ford updated the F-Series several times since 1992 while the E-Series continued on with very few changes; no powertrains were shared as of 2016. This 1955 Australian F-100 Freighter had special high side panels, perhaps unique to Australia; note the right-hand drive. As of 2018, outside of the United States, Canada, and Mexico, the Ford F-150 is officially sold in most Caribbean countries (except Trinidad and Tobago, Saint Kitts and Nevis and Cuba), Suriname, Ecuador, Peru, Chile, the Middle East (including Afghanistan), Iceland, Angola, Burkina Faso, Cameroon, Cape Verde, Democratic Republic of Congo, Ethiopia, Gabon, Ghana, Ivory Coast, Liberia, Nigeria, Senegal, Sierra Leone, Madagascar, the Dutch territories of Aruba, Curaçao, Saint Maarten and the British overseas territory of the Cayman Islands. The SVT Raptor is sold in the United States, Canada, Mexico, the Middle East (including Afghanistan), China, Ecuador, Chile and Peru. Both are available in LHD only. 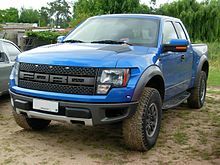 In Mexico, the F-150 (XLT and higher trim levels) is called the "Ford Lobo" (Ford Wolf) while the F-150 SVT Raptor is called the "Ford Lobo Raptor". The F-150 XL remains as F-150 XL. In Bolivia, Ford F-series truck are imported from the United States. F-150 single, super cab and crew cab are available with short and long bed. F-series Heavy Duty like F-250, F-350 are available in Super Cab and Crew cab with long bed, but the F-450 is available only in a chassis version. The F-150 Raptor is available, too. In Australia, Ford F-series trucks are imported and converted to right-hand drive by several Australian importers, mostly by the Harrison Motoring Group, which as become the largest importer of F-Series vehicles in the Southern Hemisphere. Harrison F-Trucks have become Australia's number one converter and supplier of the famous Ford F-Series badges. In the United Kingdom, most imported Ford F-Series trucks are the F-150 model, and usually the higher-end four door versions. Right-hand drive versions of the F-Series for the United Kingdom and Australia were manufactured in Brazil. In Argentina and Brazil, the petrol engines are often converted to also run with alternative fuels, E-96h (Brazilian-spec ethanol) and compressed natural gas (CNG). Biodiesel also is used in Diesel engines. The addition of the 3.0l V6 turbo diesel engine could potentially make the Ford F-150 go global and in both LHD and RHD from the factory. ^ "Ford's Best Selling Pickups Add More Features For 2008". Truck Trend. Ford Motor Company. May 25, 2007. ^ "Auto sales reach six-year high of 15.6 million vehicles sold, Ford F-Series takes the lead". Daily News. New York. January 6, 2014. ^ Cato, Jeremy (March 25, 2010). "Top 10 best-selling vehicles – The Globe and Mail". The Globe and Mail. Toronto. ^ This F-series Ranger is distinct from compact Ford Ranger series of pickup trucks introduced in 1983 for North America, although the latter used technology from the full-size trucks, such as the Twin I-Beam front suspension on two-wheel-drive models and Twin Traction Beam suspension on four-wheel-drive. ^ "Five Ford Vehicles Made the 200,000-Mile List". Ford.com. Archived from the original on May 30, 2014. Retrieved May 27, 2014. ^ Korzeniewski, Jeremy (January 13, 2014). "2015 Ford F-150 brings big aluminum to the Rust Belt [w/video]". Retrieved January 14, 2014. ^ "2015 Ford F-150 First Look - Motor Trend". January 12, 2014. ^ Thompson, Joshua (January 10, 2017). "Ford F-150 (2018 facelift, 13th generation) photos". ^ News, Auto World (January 10, 2017). "Big Ones In Detroit: Ford F-150, GMC Terrain, Volkswagen Atlas And Chevrolet Traverse To Be Presented". ^ "2018 Ford F-150 Specs, Engine - 2017 / 2018 Pickup Trucks". April 1, 2016. ^ Panait, Mircea (January 8, 2017). "2018 Ford F-150 Debuts New Engines: 3.0L Power Stroke V6 Diesel, 3.3L Ti-VCT V6". autoevolution. Retrieved January 10, 2017. ^ a b "2018 Ford F-150 Pickup | Tougher, Smarter, More Capable Than Ever | Ford.ca". www.ford.ca. Retrieved January 10, 2017. ^ "2018 Ford F-150 Photos, Diesel Engine, Specs, Revealed". Ford Authority. January 8, 2017. Retrieved January 10, 2017. ^ "Will The F-150 Diesel Be Named 'Power Stroke'?|Ford Authority". Ford Authority. December 22, 2016. Retrieved January 10, 2017. ^ "2018 Ford F-150". Car and Driver. Retrieved September 27, 2018. ^ "2018 Ford F-150". IIHS. Retrieved September 28, 2018. ^ "Latest Ford F-150 ad takes subtle shots at Chevy Silverado, Ram 1500". Autoweek. Retrieved September 28, 2018. ^ "New 2010 Ford Harley-Davidson F-150: tough truck with cool attitude; new details, inside and out". Media.ford.com. February 10, 2009. Archived from the original on April 16, 2009. Retrieved April 28, 2009. ^ Lingeman, Jake (February 6, 2017). "Molehills out of Mountains". Autoweek: 20–22. ^ "RIP: Lincoln Mark LT". September 2007. Archived from the original on September 30, 2007. Retrieved September 4, 2007. ^ "Ford SVT F-150 Raptor R to enter Baja 1000". Fordnewsblog.wordpress.com. November 26, 2008. Retrieved October 19, 2010. ^ Phillips, Drew (November 25, 2008). "Ford F-150 SVT Raptor R completes inaugural run of Baja 1000". Autoblog.com. Retrieved October 19, 2010. ^ "2008 Baja 1000 class results". Archived from the original on April 2, 2015. ^ "2010 Ford F150 SVT Raptor R Captures Podium Finish; Pricing Announced". Ford-trucks.com. Retrieved October 19, 2010. ^ "2009 FORD F-150 AWARDS". Media.ford.com. December 16, 2008. Archived from the original on July 11, 2011. Retrieved October 19, 2010. ^ "Ford Motor Company's December U.S. Sales Climb 8.2 Percent" (PDF). Ford Motor Company. Archived from the original (PDF) on April 30, 2011. ^ "F-Series drives ford to higher market share for third consecutive month" (PDF). Ford Motor Company. January 5, 2009. Archived from the original (PDF) on February 6, 2009. Retrieved May 14, 2009. ^ "FORD CAPS 2009 WITH 33 PERCENT SALES INCREASE, FIRST FULL-YEAR MARKET SHARE GAIN SINCE 1995" (PDF). Ford Motor Company. January 5, 2010. Archived from the original (PDF) on July 11, 2011. Retrieved January 5, 2010. ^ "Ford's 2010 Sales Up 19 Percent — Largest Increase of Any Full-Line... - DEARBORN, Mich., Jan. 4, 2011 /PRNewswire/". Michigan. PR Newswire. Retrieved October 23, 2011. ^ "STRONG CAR SALES DRIVE FORD TO No. 1 IN CANADA | Ford Motor Company Newsroom". Media.ford.com. January 4, 2011. Archived from the original on April 30, 2013. Retrieved October 23, 2011. ^ "Ford is top-selling automaker in Canada for three consecutive years" (Press release). Ford. January 3, 2013. Archived from the original on January 9, 2013. Retrieved January 4, 2013. ^ "Ford Motor Company Delivers Best Sales Year Since 2006; Ford Is Top Brand with Records for Fiesta, Fusion, Escape" (PDF). Media.ford.com. Archived from the original (PDF) on December 26, 2014. Retrieved April 17, 2017. ^ "Ford Posts Best U.S. December Sales Results since 2005; Ford Once Again Best-Selling Brand and Best-Selling Vehicle" (PDF). Media.ford.com. Retrieved April 17, 2017. ^ "Top 10: Best-selling new vehicles in Canada". January 20, 2015. ^ "New Products Make Ford America's Best-Selling Brand for Sixth Straight Year; F-Series No. 1 Vehicle for 34 th Year" (PDF). Media.ford.com. Retrieved April 17, 2017. ^ "Best-Selling Pickup Trucks: December 2016 - PickupTrucks.com News". news.pickuptrucks.com. Retrieved January 5, 2017. ^ 1/04/2017, Timothy Cain on. "Top 11 Best-Selling Pickup Trucks In Canada - 2016 Year End". Retrieved January 5, 2017. ^ "1950-1959 Ford Trucks". HowStuffWorks. June 20, 2007. Retrieved May 27, 2017. 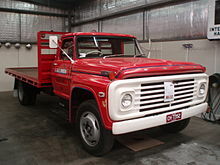 Wikimedia Commons has media related to Ford F-Series. This page was last edited on 15 April 2019, at 22:02 (UTC).